Children with ADHD need plenty of healthy, unprocessed food with good amounts of fruits and vegetables. This diet is good for every child, but especially important for those with ADHD. Most children can eat a relatively poor diet and still function pretty well, at least in the short term. For the ADHD child, however, nutrition can be crucial. It can mean the difference between making it through the school day or breaking down by 11 a.m. It can mean the difference between a successful play date and a disaster. Therefore, it is extremely important to pay careful attention to what children with ADHD are eating and the effect food has on them. The following are some very specific suggestions for the ADHD child. Research has proven that these substances can make typical children more hyperactive and less focused, and they’re worse for the ADHD child. The evidence for this is so strong that in Europe there is a warning label on foods with certain artificial colors. The warning label says: “May Have an Adverse Effect on Activity and Attention in Children.” So get rid of the Gatorade, the bright-yellow cheese puffs, the Lucky Charms, and other types of brightly-colored candy. Although not every child with ADHD reacts to sugar in an observable way, it is best — as it is for all people — to reduce sugar intake. Sodas, if given at all, should be an occasional treat. Fruit juice should be limited to one cup a day, at most. Fruit, on the other hand, is fine, if not given in excess. 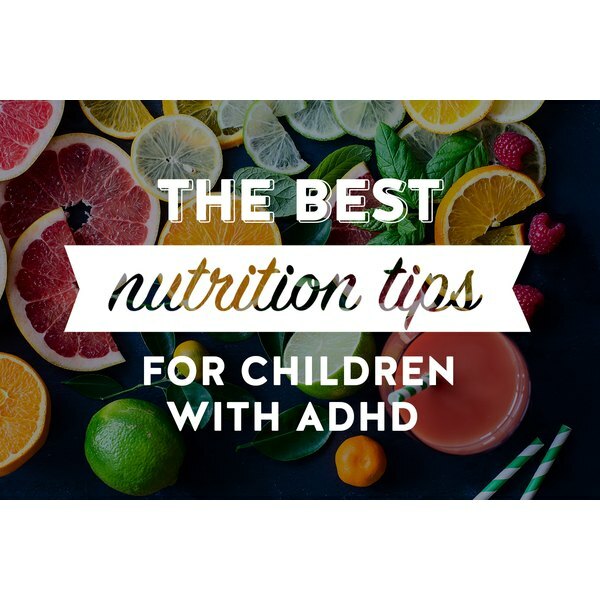 It is important that ADHD children eat breakfasts containing a good amount of protein and healthy fat, and avoid highly processed carbohydrates and sugar (such as pancakes, muffins or sugary cereals). Highly processed carbohydrates, like white flour, turn into sugar and raise the level of sugar in the blood (foods that do this are said to be high on the glycemic index). This leads to the release of hormones that lower blood sugar concentrations to below normal. It’s like a roller coaster of high to low blood sugar. Low blood sugar can cause people to feel fidgety, irritable and have trouble paying attention, and these symptoms are more pronounced in children with ADHD. What would be good breakfast suggestions? Oatmeal, whole-grain cereals, whole-grain toast with peanut or almond butter, high-protein yogurt with nuts and fruit, or some type of breakfast meat (without the nitrates or nitrites). Adding nuts or seeds to anything is a great idea. Don’t forget smoothies. With the right recipes you can pack a number of healthy ingredients into a smoothie and still have it taste great. The same principles apply to lunch — whole foods, some protein, less processed carbohydrates. Adding in fruits and vegetables would be great. Nuts are a great snack. Goldfish are not a good snack because they are made of white flour and salt. Some protein bars are a good option. There is nothing wrong with a cheese or meat sandwich on whole-grain bread. For those kids with more exotic tastes, hummus on pita is a great lunch. Eat organic as much as possible. This is not because organic foods have more nutrition, but because they do not have the pesticides, hormones, and other additives that have been linked to ADHD. In one study of 1,100 children, those with higher levels of pesticides in their urine were twice as likely to have ADHD. Eating organic fruits and vegetables cuts this pesticide load by 80 percent. I know this can be difficult and expensive, but reasonably priced organic foods are now available at places like Walmart, Costco and Trader Joes. There are certain fruits and vegetables that have a much higher pesticide load than others. You can find a list of the best and worst fruits and vegetables at this website. People often ask me about GMOs. At this point I am very suspicious that GMO foods may not be good for your health, but there has not yet been conclusive research linking GMOs to ADHD. I would avoid them whenever possible. Make sure your child eats a good combination of healthy fats. Over the last few decades, fat has become a bad word in much of diet advice. Yet over these same decades Americans have cut their fat intake and substituted unhealthy carbohydrates, resulting in a severe obesity epidemic. Quality fats are actually good for health. I especially recommend using olive, canola oil, or high-oleic safflower oil, which are high in the very healthful monounsaturated fats. Saturated fats, such as in meat and dairy, may not be as harmful as previously thought. The jury is still out on that one, but a reasonable amount of these is OK. Most importantly, it is necessary for your child to get enough omega-3 fatty acids, which are known to be crucial for brain function and are often lacking in children with ADHD. These are present in any type of fish, some more than others. Flax oil has them, but not in the form the body can easily use. I find that most children do not get enough, therefore I strongly encourage an omega-3 supplement for almost all children with ADHD. Most omega-3 supplements are made from fish oil and can leave a "fishy" aftertaste. If your child will not tolerate this aftertaste, there are also vegetarian omega-3 supplement options. Lots of fruits and vegetables provide antioxidants, which many children with ADHD are lacking. Berries contain considerably high amounts of antioxidants. I know a lot of children don’t want to eat fruits and vegetables, but keep trying. Sneak them into smoothies, soups and pasta. Multivitamins can help, but they can’t provide all the various phytochemicals found in the whole food. One final word: If the diet needs changing , you don’t have to do it all at once. It’s OK to do this in a steady, gradual fashion. And remember that everyone needs treats now and then. No one is going to have ill effects from that occasional soda or piece of birthday cake. It can be counterproductive to be too rigid. But by making these incremental changes, you may be very surprised at how your child's behavior and overall health improves. Are Vegan Diets Safe for Children?